California has the opportunity to join Colorado, Washington, Oregon and Alaska by legalizing the adult use of recreational marijuana in the Nov. 8 election. If passed, California would be the most populated state to legalize marijuana. The proposition has unknown ramifications, which has caused confusion about how it will be enforced across such a vast population and what would this mean financially for the state. Proposition 64, the California Marijuana Legalization Initiative or the Adult Use of Marijuana Act, would allow California residents and visitors age 21 and over to use recreational marijuana. Users would be able to buy up to about one ounce of marijuana, eight grams of concentrated cannabis products and grow up to six potted marijuana plants. If passed, current felony charges of transporting or cultivating marijuana for sale will be reduced to misdemeanor charges. California citizens who were convicted of these felonies could petition the court to reduce their sentence and have the felony wiped from their record. Proposition 64 would also form two new taxes on marijuana. The first would be a 15 percent retail tax on all sales of cannabis products. The second would tax the cultivation of marijuana — $9.25 per ounce for flowers and $2.75 per ounce for leaves. For UCSC students, any use of marijuana on campus, even medical usage, is prohibited. If Proposition 64 passes, students in possession of marijuana could be expelled. Many students wonder how the legalization of marijuana will affect celebration on 4/20, an annual, non-sanctioned event that takes place on April 20 at the Porter Meadows. The annual event will still be illegal because Proposition 64 does not allow the consumption of marijuana in public spaces. Oweis said if the proposition passes, public safety procedures on 4/20 will remain the same, including the DUI checkpoints at both entrances to campus. Although Proposition 64 will not directly affect life on campus, UCSC students are still speaking out in support of the proposition. But the true ramifications of legalizing recreational marijuana in California are still greatly unknown. Legal marijuana in a population of California’s size is unprecedented. We can’t determine how it will affect public safety on California roads or what businesses and funds will spur from this proposition. The main issue to consider about Proposition 64 when voting on Nov. 8 is whether or not California is ready to adapt to the changes in law, tax and medicine this measure will enact. Some critics argue Proposition 64 lacks a responsible method for detecting DUIs. The psychoactive component, tetrahydrocannabinol (THC), found in the cannabis plant lingers in the users’ bloodstreams for several weeks after smoking or ingesting marijuana. Due to the longevity of the drug, it is difficult to determine how impaired a person is during a DUI arrest. Currently, if you are pulled over in California and an officer suspects you are under the influence of marijuana, they administer a field sobriety test. These include a one-leg-standing test and a walk-and-turn test. If the officer still suspects the use of marijuana, they can request a blood or urine test, but these tests cannot determine how recently the driver consumed marijuana. “Throughout states where recreational marijuana has been passed, we have seen an increase in DUI arrests,” said UCSC PD Chief Nader Oweis. In Washington, car crashes in which the driver at fault tested positive for THC have more than doubled since the state approved legalization of recreational marijuana in 2012. According to the American Automobile Association Foundation for Traffic Safety (AAAFTS) this has led to more DUI arrests, but there is no way to determine the extent of the driver’s impairment during the time of the accident. 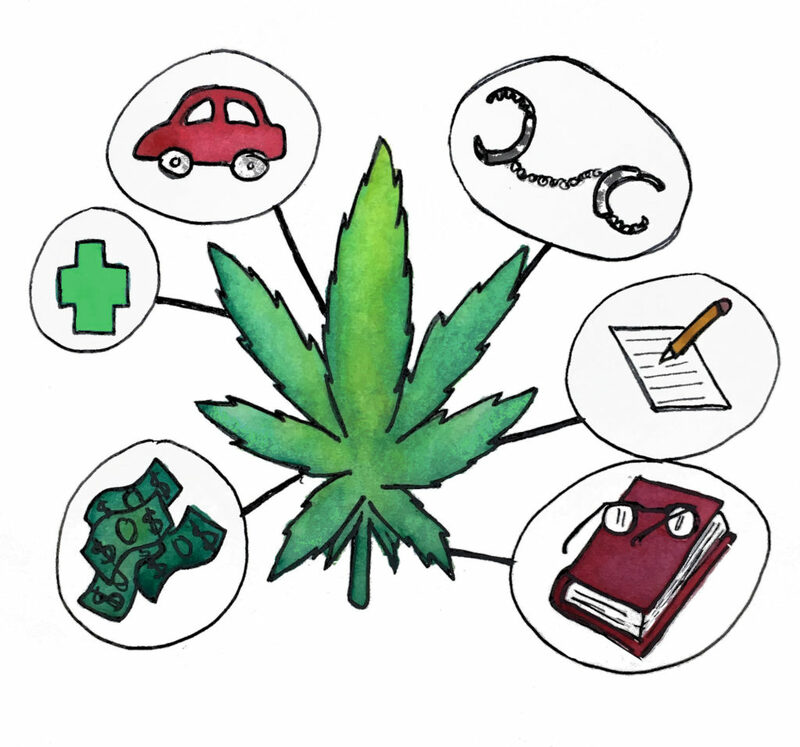 In an attempt to address this problem, Proposition 64 allocates $3 million annually for five years to the Department of California Highway Patrol (CHP) to develop protocols for testing whether or not a driver is impaired due to marijuana consumption. Locally, Measure I is on the ballot for Santa Cruz County. Unanimously supported by the current city council members, that measure would amend the vague Cannabis Business Tax Ordinance to expand taxation to include more strains of the plant and its production. Since legalizing medical marijuana, California reported 758,607 residents obtained medical marijuana cards for ailments ranging from cancer to anxiety. In Santa Cruz, the sale of medical marijuana is a large industry. In 2015 the 14 dispensaries in the city brought in a total of $32 million dollars. That would equal about ten percent of the county’s entire general fund. Money from accumulated taxes from Proposition 64, predicted to be upward of $1 billion annually, will be deposited into a fund to cover the initial costs of administering and regulating marijuana usage as well as funding enforcement of the new laws. A portion of this tax will go toward drug research, especially to measure the long-term impacts of the drug, which is why many medical associations support Proposition 64. If passed, $2 million per year will be allocated to the UC San Diego Center for Medical Cannabis Research to study the affects of medical marijuana. Remaining funds will be distributed among public safety organizations — 60 percent to drug education, prevention and treatment youth programs, 20 percent to clean up environmental damage from illegal marijuana producers and 20 percent to programs that reduce driving under the influence of marijuana.